With just a few weeks to go, now the key thing is not to panic. Your brain will be demanding to know if you feel you have done enough training. Your body is unlikely to be able to answer such an unknown since for most, a 10km swim will be a giant leap. Most will not have felt they have done enough training. Most will not have done enough but such is life. Family and work will have taken their toll and got in the way. 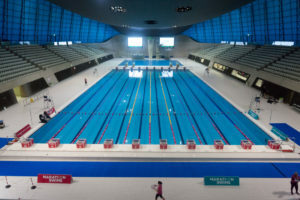 The good thing is the excitement of the event, family, friends, supporting and cheering and perhaps swimming in the Olympic pool for the first time will all help a huge amount. The buzz surrounding the event will carry you the rest of the way when the training and energy in the tank start to dwindle hopefully late into your swim. Now is the time to start checking out the event again, the format and rules. Are you are really happy with your goggles and perhaps investing a similar spare pair. Happy that your swim suit will not chafe? Thought about a lubricant to help? This is one of the best I have found. Spare swim hat? They do break and work loose. Happy about the side you breathe to <if single sided?> and the direction of the lanes? On the plus, if you only breathe to one side you will change sides with respect to the side of the building you face naturally with each shift in lane across the pool. Have you thought about on the day nutrition for your marathon swim? do you need to plan breakfast earlier? Gels/energy bars during the event? Your hydration strategy? Where possible plan to be self-sufficient. There is a water fountain as you enter the shower area before coming onto pool deck so don’t panic if you forget your water bottle. Don’t eat or drink anything new on race day, have a trial run in the weeks leading up and see if those new super gels/beetroot juice/energy drink actually sit well and do not upset your stomach. Walking out regardless of the Marathon Swims event taking place can leave you with shivers. It does to me most mornings when I walk out to coach and train. It is a vast auditorium and the pool deck surrounding the water is big. The thought that you are now treading on the ground of champions, swimming in the lanes shared by Phelps et al. It can be a bit overwhelming. Deep breath and focus on your event. Family and friends are supporting you, the many lengths completed in training are now needed. The good thing is everyone wants you to do well and succeed. The burden of not letting anyone down should not be overwhelming, we all want to do well but do not let it overburden. There is always next year if the day does not go well. Checked travel routes? We all know how unprepared London Transport can be for your big day. Think through as many scenarios as you can so you have some options. Rest the last few days heading into the event. A little extra sleep would help. With a week to go a lot more training is not going to help you finish or finish quicker. It will leave you tired and uninspired for the big day. Food and nutrition should be prepared and planned for. Know what you are having when. Great streamlines off each wall. With 100 opportunities to push off the wall for 5m each time you could save yourself 200m of swimming! Spare goggles? Get used to them with plenty of time. Swim suit good?Bring a spare. Cream if you know your shoulders/armpits chaffed during the practice long distance sets. 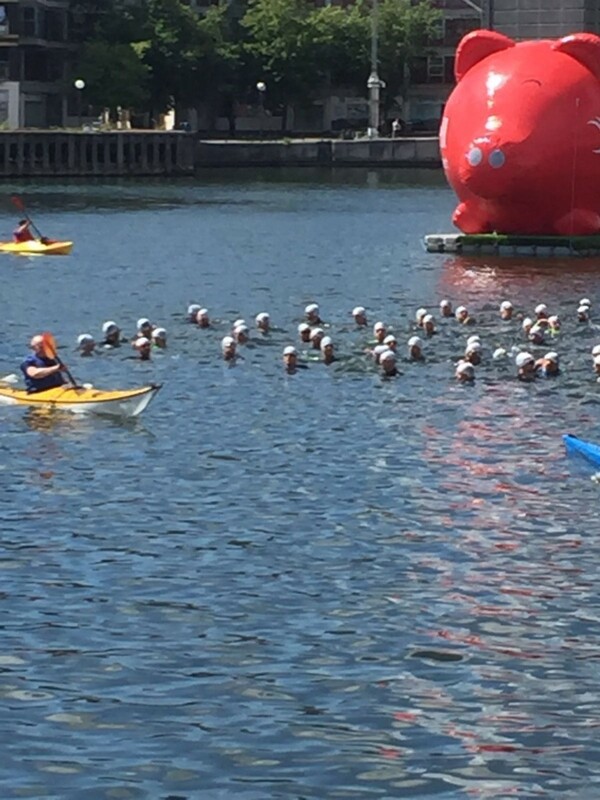 Be considerate of all in the water as you pass people. Allow people to pass you easily. Practice exiting and returning to the water in your training at frequent opportunities as this can leave you light headed if new to you. Start steady, 5-10km is a long way. Count strokes at frequent intervals to amuse and engage the brain, aim for 1metre with each arm pull i.e. 50 strokes or less. Run a technique diagnosticat the start of each 1km, think about small kick, fingertips pointing down and so palms pushing water towards the feet, head still unless turning to breathe, push and exit the hands past the hips. Why is my pool swim speed not transferring to openwater? This is a question that comes up a lot in lessons and at the lake. Considering we are not turning each 25m/50m, for most in a wetsuit in openwater we should be significantly quicker than in the pool. If you are not swimming further then what could be going wrong? 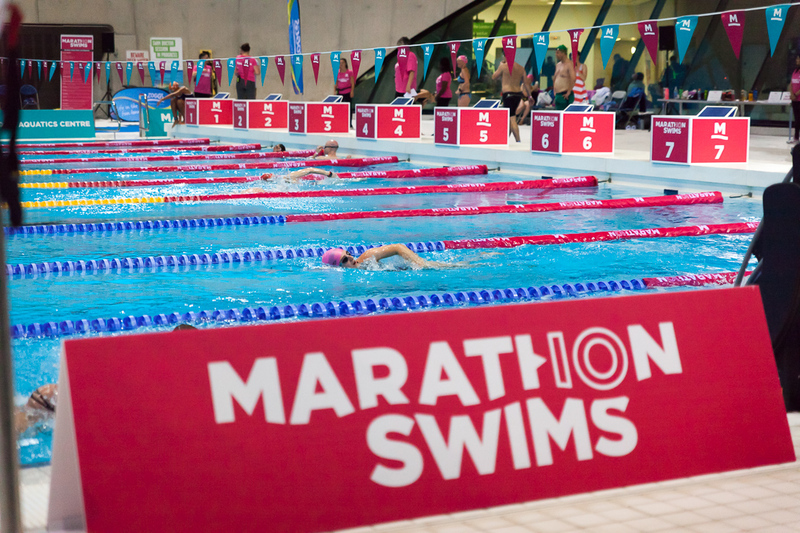 Distance from zig zaggy swimming is the usual culprit but if your watch reports back that you were a fraction over 3.8km for IM or around 1500m for the Standard what else might be slowing you? If we eliminate the obvious, i.e. distance, since just a little meandering could easily add 200-300m and 3:30-6mins easily to your time, then what remains? 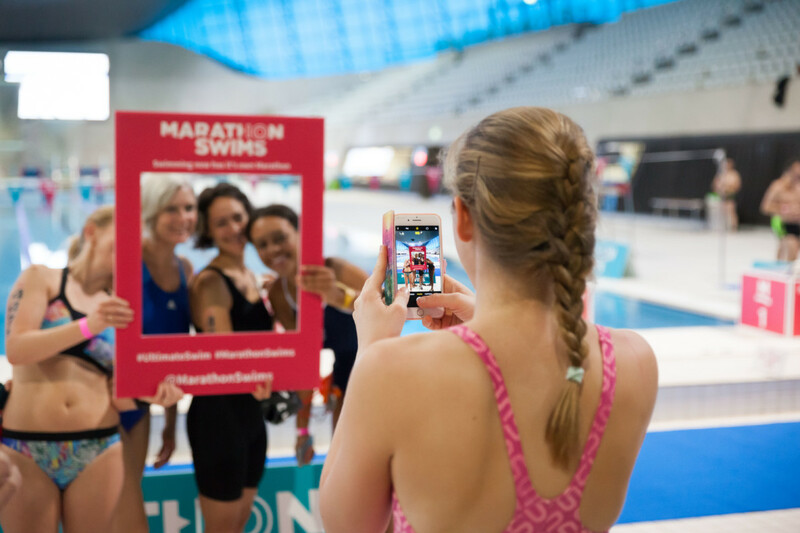 We can divide an OW swim whether it is Tri, Otilo, Aquabike, Aquathon or pure swim into various segments – prerace, the water warmup, the start, mid race, end of swim and exit. 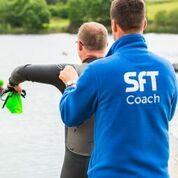 Whether you head off onto a bike or run or are finishing in the water with your event we can explore some other key areas to see where else we might be able to improve and report back with a faster swim speed from your events. has been elevated sensibly. Prior to getting into a pool based session many coaches will encourage some gentle arm swinging to start to prepare the body for the oncoming harder work. This can be useful if you want a longer mainset but only have a 60min window available. On race day, I appreciate there are 1001 things to prepare and get ready but a dryland warmup would really help. This is especially true since time in the water is limited and often cool making ‘warming up’ harder. Often the warmup area is chaotic and full of random swimmers going in all directions making a sustained swim almost impossible. Most arrive on the start line cold, technically deficient compared to a pool swim and with a poorly fitting wetsuit that is about to hinder rather than help. Your wetsuit can be a source of irritation and loss of speed for a variety of reasons. Too small and the material in the arms and legs will pull away from the body fatiguing you as you stretch against it to kick and pull. The thinner shoulder panels will struggle to sit high on the shoulders and be of use if sitting low on the arms as you did not have time to pull it up high enough. There might be problems breathing due to the constrictions around the chest and if too short in the body will leave you cramped and uncomfortable. If the suit is too big and floods you will fatigue carrying extra water around the race course with you. If you can quite easily get your suit on in under a couple of minutes then I would suspect it is too big and you could try something smaller. A surf wetsuit is neither buoyant or warm and should be avoided if you want a faster swim. A less obvious wetsuit issue is that of it being too buoyant. There will come a time as your swim tech improves you will no longer need your suit to help keep you afloat. Your swim technique will do that job. If you cannot hold the body in a neutral position it is very hard for the legs to assist your rotation and body position since they will spend a lot of time almost above the surface. If the legs and chest are too buoyant then you possibly will sit with an arch through your back that can make swimming faster harder. You will constantly be held in a head up position feeling like you are continually sighting and putting the brakes on. 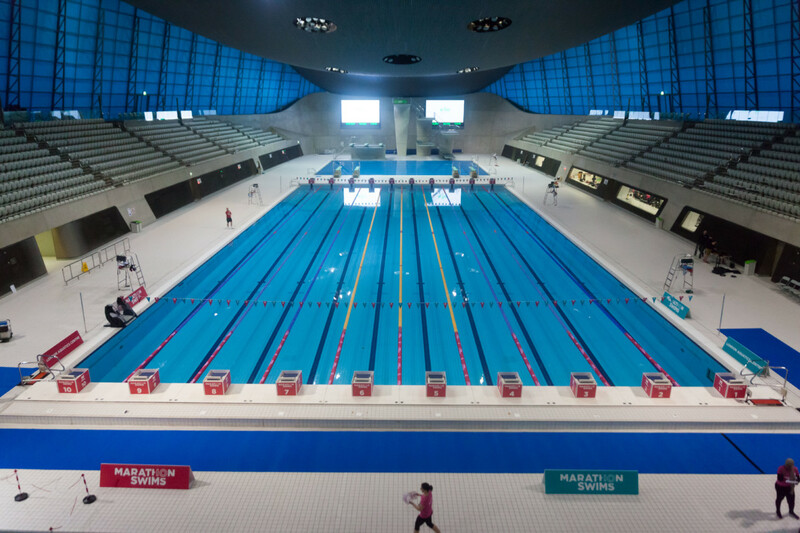 Are the pool sessions you are swimming preparing you for a harder swim in OW? Are you challenging yourself over race distance so you know not only are you competent at the distance but also to swim it with some speed? 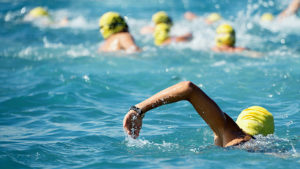 Entering swim only events is a great way of testing swim pacing and strategies. After the excitement of the start it is important to calm things down and start to work well with great technique. But not too much! Nothing beats training in openwater to get an idea of pace and how fast you can swim. In a pool session knowing you are going to finish and be done can leave the gulf between cruise pool speed and OW race speed pretty wide. A hard training swim in a lake or similar OW and then hopping onto your bike might provide some feedback to your limits in the swim. Once in a while perform a swim test that replicate’s the distance and gives you chance to see how hard you can attack the swim. For a 1900m event I would use 3×300, 3×200, 3×100 and 2×50 resting 30/20/10/5 throughout. Not enough rest to recover but some to help you keep the pace high. Build each 3 swims so you are constantly working at a good pace. To calculate a likely IM swim time to help with seeding at certain races but also to get an idea of pushing the pace and seeing if you cope you might try. Start a watch as you push off into the first 400 and subtract 4:05 at the end to collect a time that will give you an add up 3.8km time. Try it again in a month and push a little harder. Faster? Too fast? HR too high? A little experience will help you gauge the best pace for you. A degree of legkick present will assist your swim speed to a point. Too much will leave you fatigued for the bike. No leg kick will leave the arms doing all the work and have you exit probably slower but equally tired as just the arms get overloaded and fatigue the system. A better balance is to have the full body contribute to your swimming speed but keep more muscles working less hard so you arrive fresher for the bike. You need some legs to assist your rotation and help improve your body position. With a wetsuit and only if, you could get away with 0 kick but at some point, your luck will run out and your wetsuit event will become non. How many? I recall a popular race in the UK that had a busy M shape route with an additional dogleg and exit. Lots of sharp turns needing lots of sighting to avoid adding distance adds up in terms of slowing your progress. Compare to a simple U for instance with a simple entrance and exit and you will have less interfering with your speed. When I raced Tri Standard distance competitively I would try to avoid comparing races but it was helpful looking at an average of a few of them to get an idea if the season was going ok. So, if you are comparing a few OW races to your pool speed check that they have not been slow races i.e. complex courses. It is useful to look at some pro times and mid pack times from race to race to get an idea if everyone is slower. 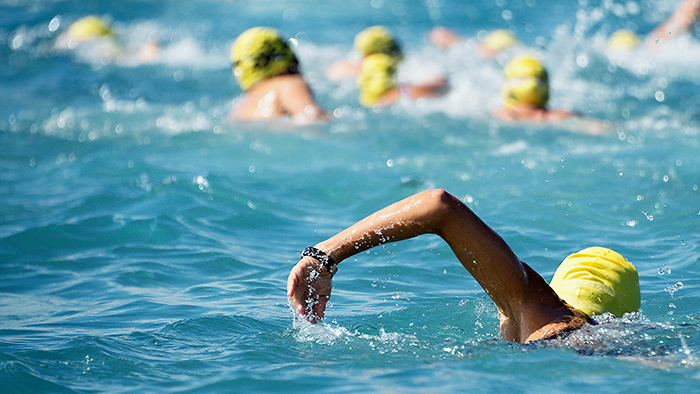 Drafting –too slow and too fast, easily done and both end with slower OW swims. Going too fast and blowing up is unfortunate and equally annoying drafting someone slow who drags you around to a slow time will leave you frustrated. Drafting well is a skill that needs refining for it to help really well. Swimming on someone’s feet is perhaps the best position to sit for the best streamline and most hydrodynamic gains for your £. Having spent part of the year working on your catch position, feel for the water, hand shape, hold on the water and lowering bubble creation you then spend your races sitting in that bubbly kick water avoiding stabbing people’s heels. No wonder it is tricky deciding if your pace is too fast or too slow. I sit on people’s hips to avoid this so I can look for calmer cleaner water and get a more accurate idea of my swim pace. Too fast let them go, not quick enough, drop them as a faster group go by. I teach the concept of trying to be the adaptable swimmer. Being able to change tactics and technique as conditions dictate can be helpful. The stroke, especially tempo, as conditions change, can adapt to take advantage of changing weather or water conditions to assist your swim. Lengthening and stretching out the stroke, lowering stroke count against a slight current will slow you dramatically. Speeding your turnover when the flow is with you might not be the best use of economy of effort. Arriving early, watching earlier waves swim if possible, looking for clues as to the conditions can help your swim. Is there any wildlife floating on the water in a river you are about to race in? how fast is it flowing. Are the ducks struggling to stay stationary? Are you going to work harder against a current or work with it, even if it means swimming further to get to your destination more quickly? The exit and a few other ideas. Long run to transition being included in your swim split? Are you Struggling to get your wetsuit off? Is it worth fully removing your suit at the water’s edge if there is a long run? At what point did you stop your watch? Don’t rely on the calculation of Time for Swim to be of use to calculate your swim speed. 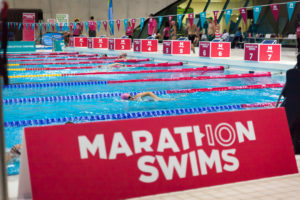 There might not have been a timing mat at the swim exit so adding minutes to your swim which would be unfair to include in any average swim speed calculation. If your pool swims are faster than your openwater racing are you comparing like for like and being fair to yourself? There is a vast difference between a 100m FC repeat in a 50m pool with a good turn, sitting on someone’s feet wearing a fast suit or neoprene shorts compared to 100m in a 25m pool, not drafting with 3 slow turns. What you are you comparing when you say Pool speed? There could be as much as 10sec difference between 100m in those two pool lengths as just described. Over 3.8km that is a big difference so keep in mind it might not be as bad as you thought depending on how you are gauging your pool based swims.